The 2018 Hyundai Accent is all-new for the 2018 model year. This car may be classified as a subcompact, but you’ll be truly amazed with how roomy this little sedan can be. This is no econo-box. This is a stylish, comfortable and spacious four-door that’s also fun to drive. And as car buyers migrate to higher driving position vehicles, such as SUVs and crossovers, the deals available on subcompacts have never been better. Now’s the time to get a great price on a terrific little car. The Hyundai Accent first appeared on US highways about 20 years ago as the Korean car brand was expanding its showroom line up. It’s no secret that it was poorly received and suffered terrible resale value, but it gained a following since it was inexpensive in comparison to its competition. When gas prices spiked about ten years ago and topped $4 a gallon, American car buyers abandoned large SUVs and trucks and reluctantly adopted the subcompact market. But, now that gas prices are closer to $2 a gallon, Texans have fallen back in love with their pickup trucks and full-size SUVs leaving subcompacts to collect dust on dealership lots. Now is the time to pick up a great deal on small car. 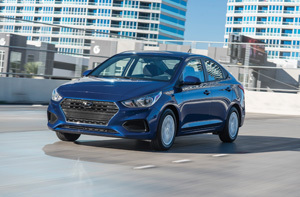 With a starting MSRP of $13,995, the new Hyundai Accent is only available with a 130 hp, 1.6 liter four-cylinder engine that delivers EPA estimated fuel economy numbers of 28 mpg in the city and 38 mpg on the highway. The exterior design features a bold new front fascia flanked by wraparound headlights. The car is also longer and wider than last year’s model. The Accent’s new larger body really makes a statement in the interior where room is not an issue. The surprisingly large trunk will handle enough suitcases for a lengthy road trip. There are plenty of premium comfort and convenience features, such as heated front seats and push button start, that are normally found only on more expensive model cars. It even has Android Auto and Apple CarPlay to maximize the features of your integrated smartphone when used with the optional seven-inch display infotainment system. You’ll be doing yourself a giant favor by taking a closer look at the Hyundai Accent. Not only will you drive away with an outstanding little car, but you’ll most likely pick up a great deal at the same time. And saving money is always fun!